The 81-year-old has welded undersea oil pipes and covered walkways in Housing Board estates, and even built his own fish tank from metal bars and glass panels. But about three years ago, he had to confront a problem that his decades of welding experience could not fix. His son Jack, then 45, had kidney failure. He solved the problem by donating one of his kidneys to Jack. He was 79. The act made him the oldest living kidney donor in Singapore, a record that the Ministry of Health confirmed this week. The soft-spoken Mr Wong was uncomfortable being under the spotlight when The Straits Times interviewed him this week. "What I did, any parent would have done," he said in Mandarin. "Which parent would bear to see their children suffer?" Mr Wong was born on May 4, 1936. His parents, who had come to Singapore from China, were grave diggers, cemetery caretakers and tombstone makers. He was the fifth of seven children. "We lived in an attap hut at the fringe of the Pek San Theng cemetery, where the present Bishan housing estate is located," he said. "There was no electricity or water." Asked if he was afraid of ghosts, Mr Wong laughed. "What is there to be afraid of? I would sneak out of the hut and sleep in the pavilions in the cemetery because it was cooler outdoors." He dropped out of school in Primary 5. "I was not really interested in studying. During tests, I would copy from other pupils," he said with a laugh. Done with school, he did various odd jobs, including being a coffee boy serving patrons at a coffee shop. "I even climbed coconut trees to pluck coconuts. $1 for 100 coconuts," he recounted. In the mid-1950s, when he was about 18, he found a permanent job as a welding apprentice at the former Kallang Gasworks. "The salary was about $3 a day," he said. "I discovered that I was quite good at it and I never stopped welding after that." At Kallang Gasworks, Mr Wong welded gas pipes and storage tanks. In the 1960s, when Pulau Bukom was being developed as an offshore oil refinery, he also found welding work there. One of his proudest moments was when he passed a welding test conducted by the Chiyoda Chemical Engineering and Construction Company on April 15, 1965. The company is part of Japanese conglomerate Chiyoda Corporation. "It meant that I was as good as a welder in Japan," said Mr Wong proudly. He has kept to this day the welding certificate issued by the company more than 50 years ago. In 1966, Mr Wong married Madam Sim Guat. He was 30 and Madam Sim, 25. Madam Sim had two children from an earlier marriage but Mr Wong took them in as his own children. The family moved to an HDB rental flat in Toa Payoh. In 1970, Mr Wong's son, Jack, was born. His daughter, Yoke Yin, followed a year later. With four children to raise, the sole breadwinner started working longer hours, taking on overseas projects that paid more. One project he remembers vividly is building Changi Airport in the late 1970s. "Many of the metal frames and structures in the airport, I welded them," he said. He also worked for several years on oil rigs in the South China Sea, near Borneo. "I would live on the oil rigs for a few months each time, welding oil pipes," he recalled. "Some of the pipes were really big, more than 30 inches in diameter," he said. "I had to climb into them to weld the joints inside the pipe." He said his Americans colleagues on the oil rigs were the best welders in the world. "Sometimes the rigs would sway, but the Americans would hold down the pipes with one hand and weld using the other, even swaying their bodies with the rigs," he said. "I tried to copy them, like how I copied from other pupils in primary school," he added with a laugh. The pay from overseas work was good, he said, at about $3,000 per month. By the late 1990s, major infrastructure and overseas work had slowed, so Mr Wong took on mostly local construction jobs. On what it takes to be a good welder, he said: "Steady hands, good eyesight and confidence, like a surgeon." On Sept 23, 2015, he put his life in the steady hands of a surgeon when he donated one of his kidneys to Jack. Six months earlier, Jack, who heads a sales department at a Harvey Norman retail store, had suffered kidney failure and started dialysis. Jack's wife and sister wanted to donate their kidneys, but both were found to be unsuitable. His two school-going children were too young to donate their organs. Mr Wong recalled the angst of seeing Jack suffering. "There was once he fainted at a coffee shop after dialysis," he said. "It was painful for me to see him like that." Then 79, he decided that he was not going to let his age stop him from donating one of his kidneys to his son. He passed a battery of tests at the National University Hospital. He was not worried, even though his family members were because of his age. "The doctor was confident, so there was nothing for me to worry about," he said. Jack was in hospital for nine days while Mr Wong was discharged after four. Barely months after the operation, he was back on his feet working on a town council upgrading project, welding covered walkways in Toa Payoh. He now spends his retirement visiting the families of his four children and stepchildren, who live in Toa Payoh and Woodlands. He has a total of eight grandchildren and a great-grandson. His wife died in November 2016. Mr Wong said donating his kidney did not affect his health. "I still eat normally and move around as I would," he remarked. On his secret to staying healthy, he said he has only two meals a day - breakfast and dinner - and he eats mostly fish and vegetables. "I also drink mostly plain water, sometimes directly from the tap," he added. He downplayed his kidney donation. "I am healthy, I also want to see my son healthy." On his father's gift, Jack, who was present at the interview, said: "I can lead a normal life now because of my dad." "My father is a soft-spoken person, he does not talk much. I also don't talk much. But this operation has brought us closer together," he said, putting his arm over Mr Wong's shoulders. "No words can describe how I feel." While the pioneer leaders were the original architects of Singapore, everyday heroes helped build society here. This is another story about such people in the series, The Lives They Live. 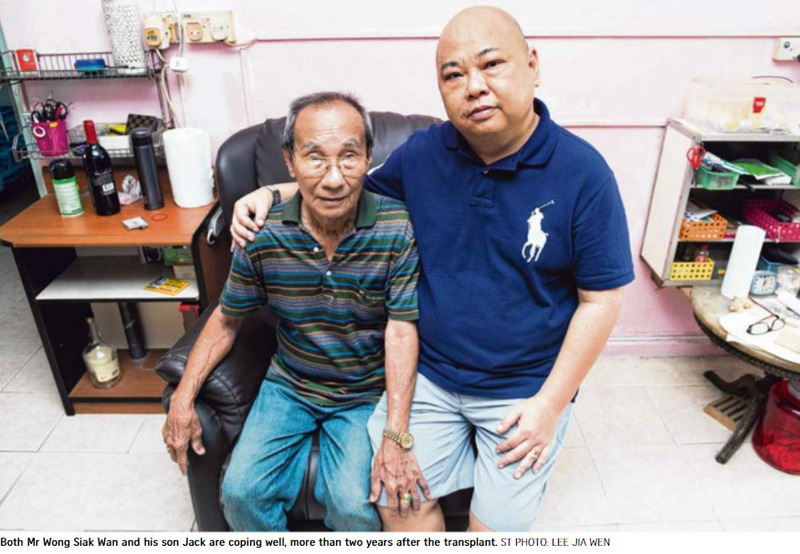 When Mr Wong Siak Wan discovered that his son Jack had been stricken with kidney failure in early 2015, he felt downcast. His spirits took another hit when no family members were found suitable to donate a kidney. "I had to try to donate my kidney," the retired welder said in Mandarin. But there was a big hurdle. He was 79, and no other Singaporean at that age had donated a kidney before. His son Jack, a salesman, was 45. However, the elder Mr Wong passed a series of tests at the National University Hospital and was found to be suitable as a donor. On Sept 23, 2015, his left kidney was removed from his body and transplanted into Jack. This week, the Ministry of Health (MOH) confirmed to The Straits Times that Mr Wong had set a record. "Mr Wong Siak Wan, who donated his kidney to his son at the age of 79, is the oldest living kidney donor in Singapore to date," a ministry spokesman said. Before him, the oldest living kidney donor here was a 75-year-old woman who donated a kidney to her 46-year-old daughter in 2009. The ministry said that the number of kidney transplants increased from 69 in 2013 to 93 last year, although most of these kidneys came from people who donated them after their death. The number of living donors has remained relatively stable at around 40 per year. Their median age also hovers around 50. The MOH said that the Human Organ Transplant Act requires organ donors to be at least 21 years old. "There is no upper age limit," the MOH spokesman said. Mr Wong's kidney transplant was performed by Professor A. Vathsala, co-director of the National University Centre for Organ Transplantation at National University Hospital (NUH). She said that health and kidney function are the two main factors in assessing the suitability of a kidney transplant donor. The donor's age matters so far as the risk of cancer is concerned. "For any donor, it is important to make sure that the donor does not have some hidden cancer which can then spread to the transplant patient with the transplant procedure. The older the donor, the higher the risk of cancer," she said. The professor dismissed the perception that an older kidney may not last as long as that from a younger donor. "We don't have enough patients with kidneys from older donors to check on this data but, for our own centre, the results seem as good as those from younger donors," she said. NUH carried out 156 kidney transplants involving live donors from 2008 to last year, out of which 17 had donors who were over 60. "All these older donors and their recipients are doing well at present," the professor added. In 2011, a study by American hospital group Johns Hopkins Medicine found that kidneys from older donors were more likely to fail within 10 years of a transplant when compared with kidneys from donors aged 50 to 59 (33.3 per cent failure rate versus 21.6 per cent). But the same study also found that patients who received older donated kidneys were no more likely to die within a decade of the transplant than those whose donors were between 50 and 59. Both Mr Wong and his son, now 81 and 48 respectively, are coping well, more than two years after the transplant. Mr Wong is unfazed by the idea that he is the oldest living kidney donor in Singapore. "I saw that he (Jack) was suffering in pain after his kidney failed," he said. "I cannot bear to see him suffer. He is my son. If I don't help him, who would? "What I did, any parent would have done. It has nothing to do with how old I am."